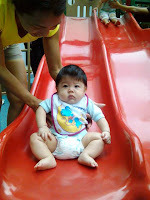 Christine Leong Spots Blog: Let's Play!!! About 1/2 an hour later, we brought him home and placed him in his sarong. He fell asleep straight away! Sigh! A good way to make him sleep!